A collection of facilities and a garden centre at the Bayston Hill Roundabout on the Shrewsbury Bypass. 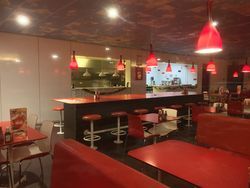 Inside the Little Chef, in 2017. Dobbies Garden Centre is positioned within the service area. 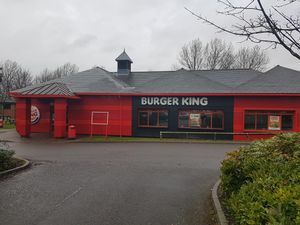 The site was built alongside an existing forecourt in 1995 as the Shrewsbury branch of Little ChefHistory, along with the motel and a tourist information. The location won Forte over instead of their preferred option at Battlefield. The Little Chef gained a Burger King, Coffee Tempo! and a Good to Go. When it was sold to Euro Garages they began to add their own catering facilities, but they later acquired the Little Chef anyway and turned it into EG Diner. EG Diner closed in October 2018 as Euro Garages stopped supporting the brand. As of March 2019, the former Little Chef section of the building still lies empty, with a few A4 notices advising that the seating area is unsafe.